HONG KONG — China is a sea of labor unrest. During the first 10 weeks of this year there were more than 400 publicly reported strikes, more than double the number during the comparable period last year. President Xi Jinping’s government has responded with a firm hand: Labor activists are being arrested and assaulted simply for demanding their wages. As China’s rate of economic growth has slowed over the past few years, China Labour Bulletin, a Hong Kong-based organization, tracked a surge in reported strikes — most likely a small measure of all the actual strikes — from fewer than 200 in 2011 to 1,256 in 2017. Government data indicates a 38 percent increase in the number of labor dispute cases heard by Chinese courts, from 589,244 in 2011 to 813,589 in 2015. Mirroring the recent trend of manufacturing moving from the coasts to the middle of the country, the most labor strife this year appears to be happening in central provinces such as Henan, Jiangsu and Anhui. And the unrest isn’t affecting only traditional industries like manufacturing. White-collar workers and new-economy industries like e-commerce and green tech are also dealing with labor struggles. In January, hundreds of teachers from all over China assembled in Beijing to bring attention to missing pensions and other perks. Last month, workers at a solar power factory in Guizhou Province staged a sit-in, and poorly paid taxi-app drivers protested in Shandong and Guangxi. Medical staff in Hebei demonstrated in February over unequal pay and the nonpayment of social insurance. Labor activists are also organizing online. In Spring 2016, the Walmart Chinese Workers’ Association, an independent group of China employees of the retailer, opposed a change that would have permitted Walmart to schedule long shifts for workers without paying them overtime. The activists used the popular WeChat messaging service to organize strikes that forced their employer to retract the new policy. The government’s default approach to labor disputes has been to treat them as a threat to law and order. After a widely reported miners’ strike in the northeastern city of Shuangyashan in 2016, for example, the Public Security Bureau arrested 30 people for what it called serious criminal charges. Miners in Hebei and construction workers in Hubei were beaten last month just for protesting to get their wages. In Guangdong Province, activists like Meng Han of the Panyu Migrant Workers Center, a now dissolved grass-roots group that helped local workers with collective bargaining, have been jailed. 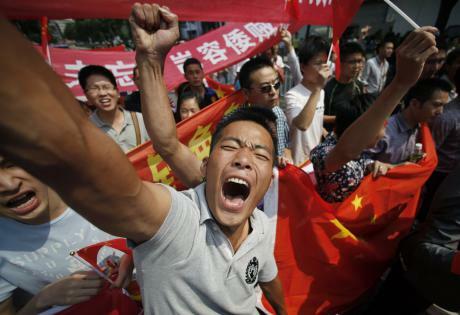 The fact is that in most strikes Chinese workers are demanding only to be paid wages and benefits that are owed to them, and for their legal right to collective bargaining. Still, why are strikes on the rise? The slowing economy has squeezed manufacturers and service-oriented companies. Many owners have responded by simply not paying workers. Many companies close shop overnight, surprising workers with the closure and the news that they won’t be paid wages that are owed to them. Meanwhile, it appears that workers are becoming more aware of their legal rights to demand pay and benefits. The 2008 China Labor Contract Law, successor to the 1995 China Labor Law, codifies wide-ranging protections for Chinese workers, including the right to collectively bargain. The law was drafted to help raise living standards but has always been unpopular with big business and its political friends. Yet in 2015 President Xi Jinping urged the sole official union, the All-China Federation of Trade Unions, to come up with a plan to improve workplace representation. Experts say that five million to six million workers could lose their jobs in the coming years as the economy continues modernizing. If history is any guide, the result of the job losses is likely to be more unrest. And a government that denies hard-pressed workers a legitimate channel to express their grievances is inviting trouble. As strikes continue, workers broaden their demands and are driven to more extreme measures. By ensuring that workers can use their legal right to collective bargaining, the government could help families to share more of the rewards of growth and give a boost to the rebalancing of the economy. This was the story of America’s postwar boom years, when strong unions helped to expand the middle class. The Communist Party should fully embrace its historical claim to representing workers. By enforcing legal protections the party may find that higher household incomes are a solution to slower growth as well as to the country’s more serious ills of unfairness and inequality. You gotta be kiddin’ me. Like it ever cared about “workers”.